Neil Triumphs Caliber - Cars! Cars! Cars! The Neon bolted from a cold-dead stop to 60 mph in a wig-twisting six seconds; the Caliber R/T leaves the line, stops off for lunch and a high colonic, checks its e-mail, then finally arrives at 60 mph in a stupendously boring 10-plus seconds, which means it can be dusted by your average UPS truck. The Caliber is new. All that remains is for it to be improved. 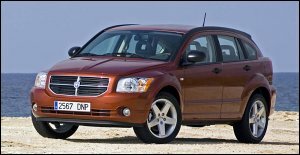 New for this show was the Dodge Caliber, a small wagon. It felt pretty cheap to us, but at $15k, maybe we were setting our expectations too high. The seats didn't feel very comfortable, either. Our main concern was that the subcompacts from the big three Japanese makers felt better put together. Anyway, the Caliber needs some massaging. Hell, so do we. Oh, Alison! Time for the daily Cars! Cars! Cars! rubdown. Oh, stop the retching already. First I agree that there are a couple of curious weak points. "curious" because they are so easily seen and inexpensively fixed. The Japanese are much better at avoiding obvious mistakes. You really wonder if the execs of GM, Ford, etc. actually ever look at their new models. Could they identify any from twenty feet? That said. The Caliber is a winner unless they botch it up with poor build quality or other suicidal ideas. I've looked at them (I'm shopping) and seen them on the road. People look and like. I know you're in the middle of an America-bashing session right now but, seriously, have you talked with anyone who owns one? I was at a bar the other day listening to some guy expounding the virtues of the vehicle...unsolicited. I'd trust this average Joe over your knee jerk responses anytime. Please, give America a chance.